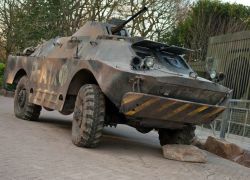 The opening of Nemesis Sub-Terra was not exactly warmly received by the majority of guests that experienced it in its initial condition. While it was pretty unforgivable for Alton Towers to present a major new ride in such a condition, they have certainly listened and learned from the backlash. They have managed to turn a confusing and anticlimatic attraction into one of Britian’s finest dark rides – of which it already has one example in Hex. As you now prepare to enter the Phalanx facility, you are ushered into the pre-lift batching area by the in-character staff in a less aggressively audible manner as before. The toning down of the Phalanx operatives is the first thing that’s noticeable, but they’re still straight faced while delivering humorous quips. Video screens display a minute-long film which briefly explains the Nemesis legend and the discovery of an egg underground. This is an overwhelmingly huge improvement as while video screens play outside in the queue line, they are often inaudible or simply ignored by guests. 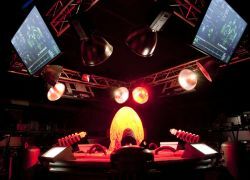 There are numerous changes to what takes place in the main chamber, with the lights going out and the egg showing to have hatched before the towers fall. The four towers reportedly drop at slightly staggered times, but we did not observe this due to the darkness, or perhaps our tower dropping first. The force is still lackluster compared to the higher mass of the double-sided models at the Dungeons, but effects such as back-pokers and leg-ticklers are now in full operation. Water sprays, air blasts and extremely loud sound effects are also repeatedly used to great effects. The lower chamber featuring stalagmites and a nest of eggs is now much more clearly visible (while still dark and eerie) and you can see people’s reactions to the effects on the other towers. The loudness of the effects drowns out the sound of the towers returning to the top of the structure. Numerous people have their head in their hands and are clearly scared by the ordeal, the staff re-appear to usher us out before the end of the dramatic 30-second countdown. The escape lift plunges into darkness for a long period and the movement and sounds of the escaped creature attacking remain. Phalanx operatives no longer accompany you on the ascent lift ride, instead you area greeted by one by torchlight as the doors open into darkness. This darkness signals the start of the major new addition made to the experience, the inclusion of a mini scare maze featuring gas-masked actors covered in blood. You make your way through a tight corridor of air blasts and actors lunging at you with flashlights and manic stares. Eventually emerging into daylight, you are left feeling very satisfied and almost as if you have just had a bit-part in a science fiction film. Nemesis Sub-Terra is now everything it should have been on opening day. Alton Towers can just about be forgiven. 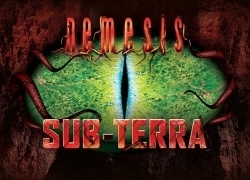 4 Comments on "Review: The revamped Nemesis Sub-Terra"
This was our first time on this ride. So we did not know what to expect…We thought it was a proper ride as we were locked into our seats. Both my husband and I thought the rows of seats would start turning or something like that….then the darkness came, the egg hatched! I grabbed his hand as I didn’t know what was going to happen…then he and I both yelped as we were pocked in the back, sprayed on and the backs of our legs tickled, right before we were dropped to the lower floor!! Truly AMAZING! The actors were great! I was still laughing and coming to terms with what happened 5 mins later…better than the SAW maze! I’ve only been on it after the new changes (only knew about the changes after reading this article). When the towers dropped and I was being poked etc. I was literally screaming in terror, I had never felt so scared in my life. I can laugh down Oblivion but Sub Terra nearly sent me to tears when I ran out screaming! I too felt like I was in a film. The whole experience was tremendous!